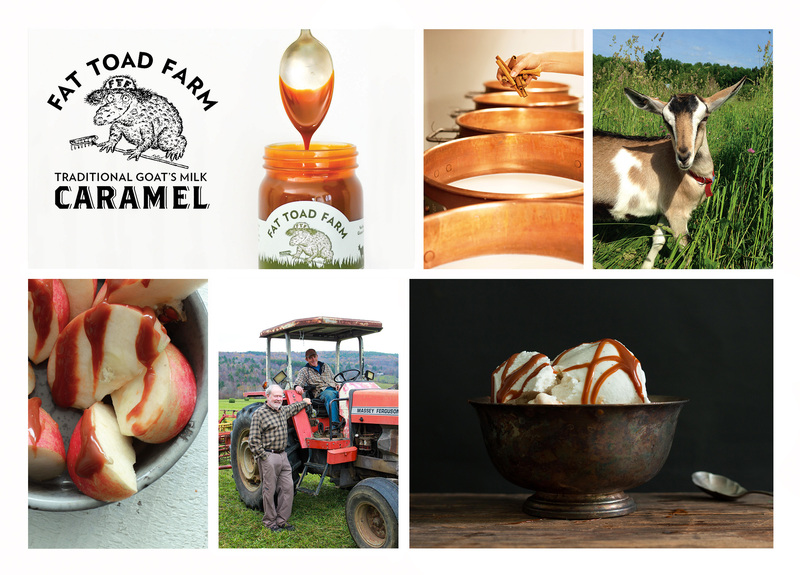 Since 2007, Fat Toad Farm has worked to perfect the art of goat's milk caramel making, focusing on traditional cooking methods and using a small number of fresh, simple, all-natural ingredients. Starting out as an experiment in homesteading and hand milking a lovely French Alpine doe named Jupiter in our garage, Fat Toad Farm began its production sourcing all of our milk from our own herd of dairy goats. Eight years later, we were milking Jupiter's daughter Artemis and 60 of her closest caprine friends in a modern parlor. Each year, our family-run business, founded by Steve Reid, Judith Irving, and Calley Hastings, continued to grow incrementally to meet the increasing demand for our award-winning Goat's Milk Caramel Sauces. As we neared our ninth year in production, we realized we had outgrown our farm and looked forward to the next steps for our family, farm, and caramel. At the start of 2016, we began our partnership with Vermont Creamery to source a year-round supply of fresh, local goat's milk. Our beautiful and mischievous herd of 75 dairy goats moved eight miles down the road to Ayers Brook Goat Dairy, a first-of-its-kind model goat dairy in the United States run by Vermont Creamery. Our goats joined the herd over at Ayers Brook and began to supply milk for both our goat's milk caramel sauces and Vermont Creamery's award-winning artisanal cheeses. Our goal has always been and continues to be to produce the highest quality, traditional goat's milk caramel sauces, using the freshest goat's milk available. Our dedicated team continues to produce our Goat's Milk Caramel Sauce right here on our farm, meticulously hand-stirring it to velvety perfection in small batches. You can still find us down our beautiful, winding, sometimes muddy, sometimes snowy, sometimes really muddy, dirt road carving through the hills of Central Vermont producing the traditional goat's milk caramel we always have. Check out THIS VIDEO, made by FedEx for being the 2014 Winner of the FedEx Small Business Grant, to get a glimpse of Fat Toad Farm history. Enjoy!